Seven hundred years ago a small City of London church lay with its eastern edge hard by the top end of Dowgate Hill and its west end overlooking the banks of the Walbrook. Along its southern edge ran Cloak Lane, then part of a continuous street running from Dowgate Hill to St Andrews Hill near the City wall. The church was one of 109 located in the City, an astonishing number considering the City was only a square mile in size. These parishes varies in size any many were tiny, some including only a couple of short streets. St John's parish was located in the centre of its parish, which was shaped like a slightly irregular rectangle whose width was no more than twice the length of the church and whose length extended from the southern end of Walbrook to a point about the same distance southwards, stopping well short of Thames Street, as it then was. This was a tiny area, a little under 2½ acres, and later surveys of the parish suggest this accommodated no more than 75 dwellings. St John's church was certainly in existance by 1181 and was periodically repaired, rebuilt or improved, the last occasion being in 1621. Unfortunately the great fire that occurred in September 1666 burnt-out and hugely damaged the church so as to be unusable. 88 other City churches met a similar or worse fate. When Sir Christopher Wren's committee was established in 1870 to determine which churches ought to be rebuilt, St John's was not among the 51 selected and the parish was combined with St Antholin, Budge Row. In 1873 the parish was further combined with St Mary Aldermary. Though the church, being of stone, had not been entirely destroyed events were more dire for the inhabitants in their wooden houses, for descriptions suggest every house in the parish was destroyed and the parish had only a technical existence. The church remainins having been pulled down, the space vacated was converted into a churchyard to accommodate the ongoing need for burials in the enlarged parish, which was eventually rebuilt and repopulated. Whether the old church had any form of churchyard I do not know, but it is obvious from pre-fire maps that if it did it cannot have been very big. The first Ordnance Survey large scale plans suggest by 1870 the churchyard had been laid out as a small garden or park, presumably after burials ceased in 1852. The District, jointly with the Metropolitan, gained powers in 1879 to connect their systems between Aldgate and Mansion House by means of a connecting railway, which appeared finally to discharge their moral responsibility to complete the inner circle railway (for which powers had been first granted in 1868). The joint line was called the City Lines and Extensions Railway and began at the east end of Mansion House station, running east under Cloak Lane to Cannon Street station before continuing under Cannon Street itself. The law at that time required railway companies buying land compulsorily to buy the whole of a property any part of which was required for the railway. Since Cloak Lane was very narrow the City Lines found itself having to acquire all of the properties on both sides, and this included the churchyard. Although the railway would be driven only through the southern edge of the churchyard this would inevitably disturb the bodies buried there over two centuries. To deal with this, the 1879 Act contained a provision that the City Lines company must construct a vault in the north-west corner of the churchyard into which the disturbed remains were required to be placed. The same section also required the company to erect over this vault a monument recording the transfer of the remains, the cost of such monument not to exceed £100. The work having been completed, the company was then required to restore the surface of the remaining part of the churchyard (not to be less than half the original area). These [remains] were carefully collected and placed in wooden shells, which were deposited on layers of charcoal, in a carefully constructed arched vault at the western end of the yard. This vault, which contains about 170 of these boxes, was carefully sealed. The railway was actually driven partly under the old church wall and tower. The foundations were substantial, the immense thickness of the rubble work being remarked on, especially under the former tower. The monument itself has fortunately survived the rigours of time, and war, and may be seen today in Cloak Lane; fortunately it was listed (Grade II) on 5 June 1972 so has a measure of protection. Today it is set into a recess forming the lower storey of a modern building, the whole of the churchyard area having been built over, notwithstanding the requirement of the railway to make good as much as possible of the old ground. Rough estimation suggests that the monument probably does sit above the vault though I have not been able to determine its exact position when originally erected. A description in an antiquarian journal from 1908 describes it, but the position is given merely as the north side of Cloak Lane, near the east corner, which is not very precise. There must be a suspicion that various building works may have caused it to be shifted slightly over the years. Certainly the monument was removed for safe keeping while Nos 70-74 Cannon Street was rebuilt around 1980, the rear being in Cloak Lane. 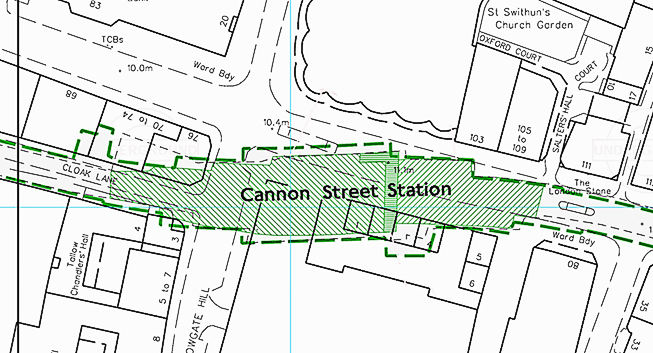 The planning application rather suggests this incorporated the surviving part of the burial ground, presumably that immediately above the vault and maps and aerial photos do suggest a gap in the building line here. Certainly it is described as a garden in 1951. It would be interesting to know more about the circumstances by which this open space finally disappeared and what happened to the bodies disturbed by the later buildings. The actual monument is substantial and stands about ten feet high. 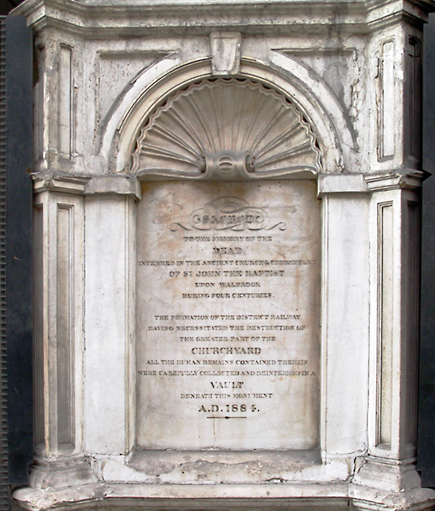 It bears the inscription: 'The formation of the District Railway having necessitated the destruction of the greater part of the Churchyard all the remains contained therein were carefully collected and reinterred in a vault beneath this monument.' It is to be noted that the District Railway is held culpable for this, though the Metropolitan was equally guilty, the 'crime' being committed by a jointly owned railway. Cloak Lane being so narrow, the City Lines company had a tremendous amount of work to do. Along the north side it was found possible to shore up and underpin the buildings, many very substantial structures requiring tedious, lengthy and delicate work, most of which was completed without incident, though it was hugely disruptive. Along the south side most buildings had to be demolished, and this included the sumptuous hall of the Worshipful Company of Cutlers which was acquired compulsorily in 1882. This had to be entirely rebuilt by the City Lines on a new site to the designs of the livery company's architect. This alone was an extremely expensive piece of work. Anyone who has visited the hall will testify to the workmanship that has gone into it. They might reflect on where the money for all this came from and that owing to the huge cost of building the City Lines it was a financial disaster for nearly thirty years. The image below is from the Agas map of London (1561) showing in 3D form the church of St John the Baptist, Walbrook, highlighted mauve. It also shows the tiny parish it served if you can imagine a vertical strip about twice the width of the church extending upwards to a point just short of the edge, and downwards as far as lower edge. The street in which the church is labelled is Cloak Lane. Today, Cannon Street station occupies the bottom right hand quadrant. A section (below) of Rocques map of London (1746) showing a similar area after destruction of the church, where the churchyard is visible near the centre. Ordnance Survey maps from about 1870 suggest this changed little over the decades except for the addition of various circles of paving that might indicate conversion to a park. The map below, from the 1960s shows the gap fronting Cloak Lane at rear of 68 and 70 Cannon Street. This appears to be the remnant of the churchyard. The small unlabelled rectangle above the 'N' in 'Lane' might actually be the monument or it might be a ventilation shaft known to have been installed by the District. At any rate this feature is approximately where the vault lies beneath. This site was later built on. The view below looks west from the Cannon Street end of Cloak Lane and shows the late 1970s building on the right with the monument located in the second arch. It has been repurposed to hide the air-conditioning condeners on the wall behind it. Below is the monument itself. I suppose that the £100 price cap place on it by Parliament might equate to £10,000 today but have no idea how much this kind of work actually cost. Below is shown a large scale plan showing the boundary line of the District tunnels and towards the left (above the name Cloak Lane) may be seen the protrusion where the vault is located. I do not know if many LU staff are aware of this but if during repairs they breach the wall of the vault and look inside they are going to get a surprise.